Severe Combined Immunodeficiency (SCID) is a rare condition in which a baby is born with a faulty immune system. Babies with SCID are lethally vulnerable to infection, and are often diagnosed when a vaccination causes a life-threatening reaction. The only curative treatment is a bone marrow transplant, which infuses the donor’s immune system. Kolya’s brother and sister had already died before they were 1-year old. The trouble was that Kolya lives in a very poor country without any possibility to cure him. 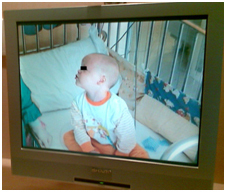 When Lifeline heard about Kolya we brought him to a Western hospital where a donor was found. After treatment lasting a year, Kolya is as healthy as any other 2 year-old and has returned home with his happy parents. His treatment cost £100,000 although it can cost more if longer treatment is needed. Lifeline has already arranged 263 bone marrow transplants, but every month there is a new Kolya whose life needs saving. Babies with immune deficiencies need to be treated early in the first year of life so we get some very small patients.